Accuracy and solution time are two of the most critical concerns in computational fluid dynamics (CFD) simulation, and both are highly dependent on the characteristics of the mesh. Different types of meshing elements are needed to deliver optimal performance in resolving different geometries and flow regimes. But transitioning between varying types of elements has long been a challenge. conformally connects these two meshes with high-quality polyhedral elements without putting excessive numbers of elements in the transition zone. As a result, the world's most widely used CFD tool now delivers better quality cells 45% faster and requires 30% less RAM. 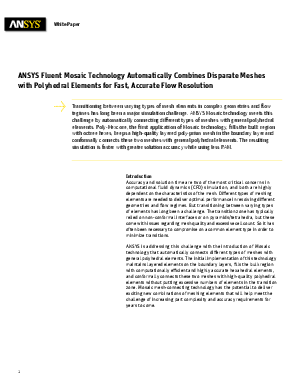 Mosaic mesh-connecting technology has the potential to deliver exciting new combinations of meshing elements that will help meet the challenge of increasing part complexity and accuracy requirements for years to come.